I WAS A WITNESS, Man Am I Glad I Was!!! Sometimes in sports special games and events take place, and they mark a place in your mind that you were there. During my now over 40 (we will leave it at that) years of participation in competitive sports at the prep and college level on the gridiron and diamond, and three years of doing media at the local and national level, many games stick out. I was in the Alamo Dome as a fan when the CATS won the National Title in 1998; on media row in Dallas when Aaron Harrison knocked down the dagger to send the CATS to the National Title game in 2014; on the baseline 20 feet away from Luke Maye back in March when he knocked down the shot to beat the CATS in the Regional Final; a few yards away from Phillip Watts as he made the catch from Waylon Chapman to win Breathitt their first State Title in football in 1995; and on the field as a volunteer assistant for Breathitt’s 1996 and 2002 State Titles. Each one of those events make me say that I bore witness to them. Last night’s 14th Region Volleyball Semi-Finals are now added to this list of phenomenal sporting events that I have witnessed. October 25th, 2017 was one of those nights that if you were not in Rose Gymnasium in Campton to witness both Semi-Finals, you definitely should have been. Many of you are like me, with very limited experience with High School Volleyball. When I was in high school in the late 80’s at Breathitt, Title IX was not the law and there was no volleyball or softball for ladies to participate in. Before last week, I had been to and shot one game for Bluegrass Sports Nation, and that was last year. It happened that I was free on Monday last week (my boys’ football season are completed) and was able to take a few pics and cover the 55th District opener between Jackson and Breathitt, and then freed up a night to do some coverage for the Championship game. Those were my 2nd and 3rd matches. 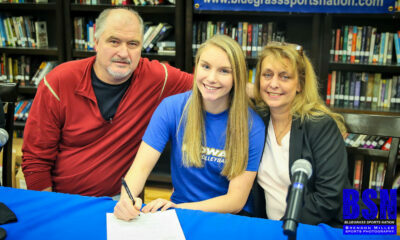 I did not even know what a libero was, as I exhibited in a press conference on Monday. Wolfe County then asked us to do media at this weeks’ tournament to give some visibility and exposure to 14th Region Volleyball. Last night’s Semi-Finals deserve that exposure and more. The first Semi-Final match was the highly anticipated matchup between the Wolfe County Lady Wolves and the Hazard Lady Bulldogs. Wolfe County came into the match at 24-9 and the 55th District Champions, while Hazard led the Region in wins at 25-7 and the 54th District title holders. The two had previously met on September 9th in the Finals of the All A Region in 5 set battle with Hazard taking the title 15-13 in the 5th. 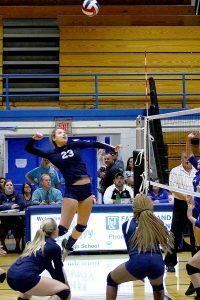 To add to the buildup, earlier in the week, Hazard Coach Candi Fannin had been named the Region Coach of the year and Wolfe Junior hitter Brooke Trompler was named the Region Player of the Year. The gym was at a fever pitch as the Wolves pep section and Bulldogs fans created an intense atmosphere. The level of play during the match was incredible from both teams. Both teams played above the net with Wolfe hitters Brooke Trompler and Taylor Mayabb and Hazard hitters Haley Turner and Hope Clark continuously pounding away and the back line for each team consistently digging the spikes and hustling and passing to keep points alive. 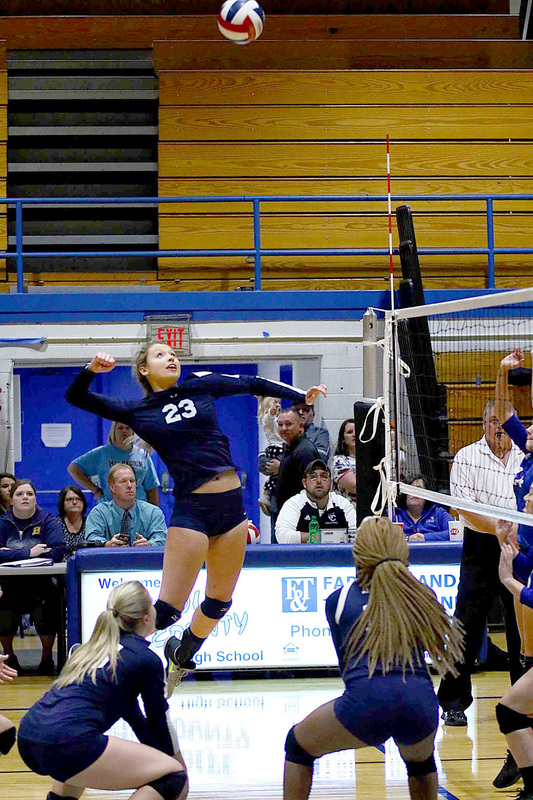 The teams traded sets with Wolfe taking the first 27-25, Hazard the second 25-15, Wolfe the third 25-20, and Hazard the fourth 25-19 to set up the decisive fifth set. Hazard prevailed 15-11 to advance to tonight’s Final. The emotion after the game was palpable in each post-game press conference. Hazard was overjoyed to have pulled out the victory and the Lady Wolves were heartbroken. Many tears were shed including those by the undersigned to see these quality young people. This was simply one of the best games, volleyball or any kind, that I have witnessed. The second Semi-Final was not as highly anticipated, but turned out to be just as memorable. Letcher Central came into the game as the 4-time defending Region Champs at 20-9 and the 53rd District Champion. Leslie County was 20-12 and the 54th District Runners-up. The match was tight throughout with favored Letcher Central winning both the first and second set 25-19 and 25-21 behind hitters Kayte Morgan, Savannah Parsons and Meghan Combs. While most in Rose Gym thought Letcher would go on to close out the match, the Lady Eagles had other plans. Leslie battled elimination by continuously winning points with grit and hustle to win set three 25-21 and then continued the momentum to take set four 25-22 to send this match to a decisive fifth set. The fifth set was truly a sight to behold. Leslie continued their momentum behind Seniors Savanna Morgan and Lexie Webb, opening up a lead of 10-2 in the race to 15 points. A huge upset was imminent. Letcher battled back but was down 14-10 with match point being served to them. That is when the heart of a Champion shone through as the Lady Cougars won the final six points to win the match 16-14. This was both an epic and ironic result, as it was a 180 turn on the epic Leslie comeback to beat Letcher in May on the softball diamond in the Semis of the Region. Those select few of us who stayed for that 5th set witnessed the best that can be seen in prep athletics, from both sides. I have tried, but I simply do not think my words can appropriately describe the level of play and effort that was exhibited by each the teams in both phenomenal matches. Beyond the play on the court it was so impressive to see each of the coaches and teams collect themselves after the intense ending to the games and exhibit class and professionalism to attend our Press Conferences for Bluegrass Sports Nation and represent themselves and their schools well. I am a newcomer to this sport, but I was fortunate and blessed to have been a witness to a spectacular sporting event. I was a witness, and I am an absolute fan of 14th Region Volleyball and the great young ladies that participate in it. Brendon D. Miller is co-owner of Bluegrass Sports Nation, owner of Sugar Camp Golf Club in Jackson, a sports photographer who shoots national events, and an attorney in Jackson, Kentucky. Brendon D. Miller is co-owner of Bluegrass Sports Nation a sports photographer who shoots national events, and an attorney in Jackson, Kentucky.